Clyde Butcher and me at his Venice, Fla., gallery, studio and darkroom. I never thought I would retire to Florida. When I thought about where I would retire, I pictured myself in the Smoky Mountains, maybe the Pacific Northwest, perhaps somewhere in Montana, or Arizona and the Southwest. It just wasn’t Florida. It’s not that I have anything against Florida, but I just didn’t consider it a landscape photographers dream location. And in retirement, one thing I was pretty sure of was that I wanted to spend a great deal of my time outdoors photographing landscapes. But central Florida is where I ended up. Happy about the move and once I settled on the fact that this would be home, I began researching Florida photographers, more specifically, Florida landscape photographers. One name appeared at the top of every search. Clyde Butcher. 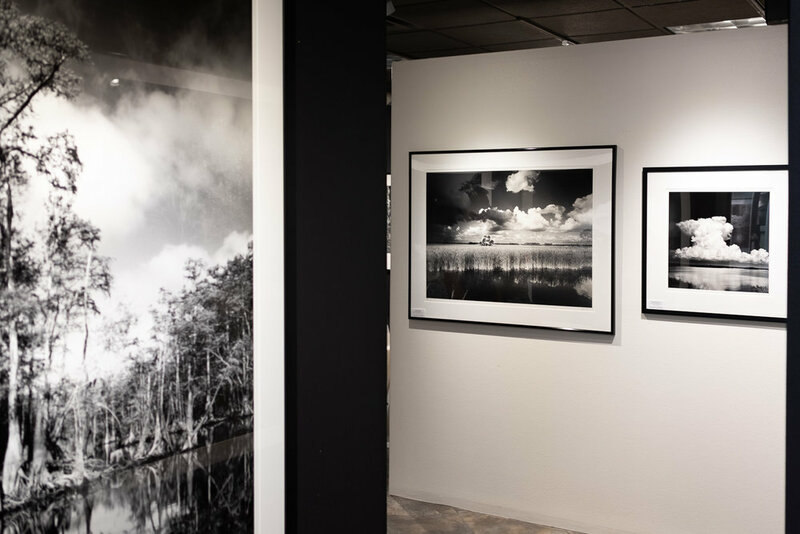 Clyde is probably best known for his large format fine art black-and-white photography of the Florida landscape. Specifically, what caught my attention, was his work documenting Big Cypress National Preserve in Southern Florida where he owns 14 acres and where he continues to lead tours through the swamp located behind his gallery. Clyde’s Venice Gallery and Studio is open Tuesday - Friday, 10 am to 4:30 pm . His black and white photography of the Florida landscape is inspiring me to get out and explore my new home state. While browsing his website I saw an opportunity too good to pass up. Twice a year Clyde holds an open house at his Venice Gallery and Studio, located in an industrial park on Florida’s Gulf Coast, about 80 miles south of Tampa. And it just so happened that the November opening would take place when I was in Florida. This was my chance to meet Clyde and get some first-hand inspiration. The gallery is beautiful and seeing his photographs in person, up close, was a real treat. I also had the opportunity to listen as Clyde talked about some of his work and then we discussed Fuji cameras and shooting digital while he signed my copy of his book Florida Portfolio II. A 12x20 Ron Wisner Field Camera in Clyde’s studio. While known for his 8x10 view camera, I found out that Clyde has been using the Fujifilm GFX 50S 51.4MP mirrorless medium format camera lately and it just so happened that during PhotoPlus in New York City last month, I became interested in their latest medium format camera due for release in December, the Fujifilm GFX 50R. And it was Clyde’s photographs and those Florida landscapes that I was thinking about when I held that camera and formulated a plan to justify the purchase. This huge rail camera turned enlarger, is just one of a unique collection of enlargers that occupy Clyde’s darkroom. Besides viewing his photographs and talking to few minutes with Clyde, I was able to tour his amazing darkroom. It’s been many years since i’ve stepped into a darkroom, but it brought back many memories, and not just that familiar smell. It brought me back to how I started and there’s inspiration in that too. I think I’ve found the inspiration I need and I’m ready to explore the Florida landscape. Next, I hope to visit Clyde’s gallery in Big Cyprus and maybe even take a walk in the swamp.